Your wedding day should make you feel like a princess. This is probably the only time in your adult life where you can get away with wearing a tiara or crown. These aren’t the crowns or tiaras of pageant winners. The crowns we’ve covered here for your wedding day are incredible, wearable art that will make you shine. 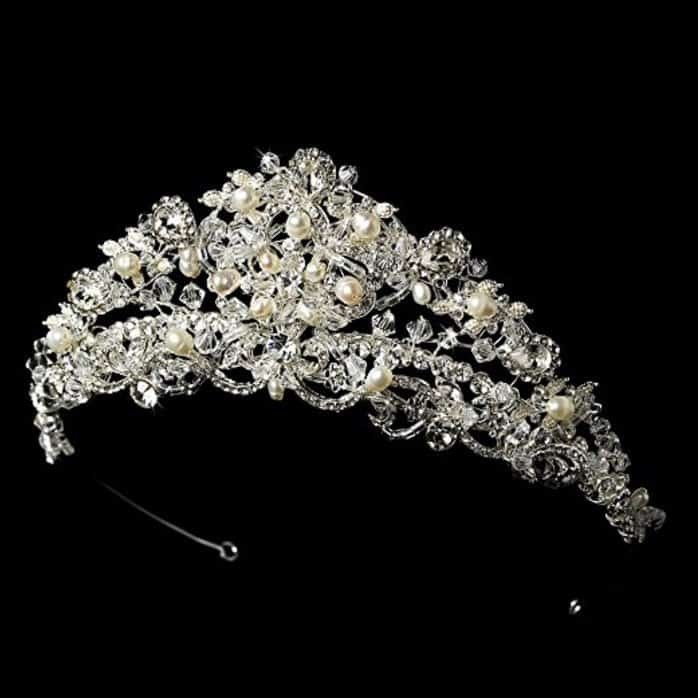 This wedding tiara with Swarovski crystals and freshwater pearls is a beautiful addition to your wedding gown. The tiara can be nestled on top of your head with your hair styled around it, so it looks completely natural for your fairytale wedding. The edges of the tiara has small loops for attaching bobby pins to keep the tiara secure. The tiara measures 9 and 1/2 inches wide and 2 inches tall with pearls, rhinestones, seed beads, and crystals. For elegant sparkle on your wedding day, this tiara will allow you to play princess on the biggest day of your life. You won’t have to worry about coordinating with your wedding set or clashing with your gown. 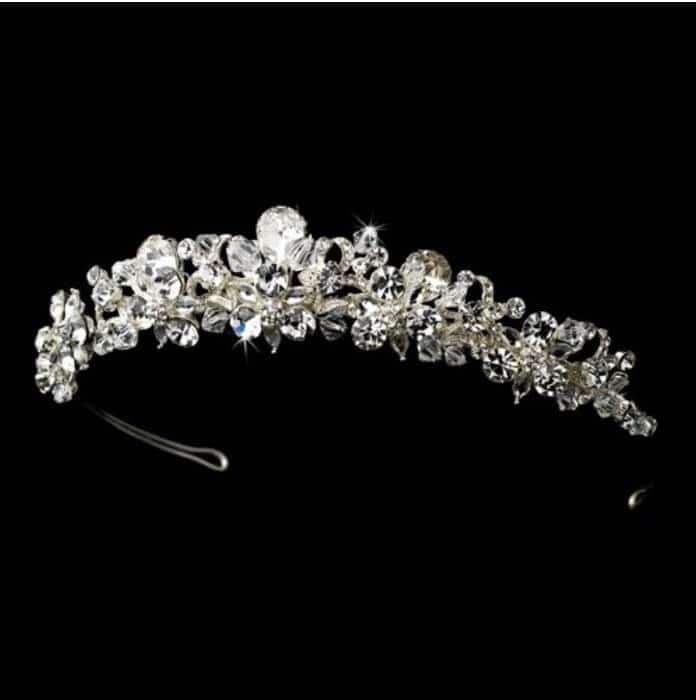 This wedding tiara has clear genuine Swarovski stones and clear rhinestones. The style and colors lend itself beautifully to a winter wedding if that’s your plan. The crystals and stones measure about 8 inches long and 2 inches high at the highest. There are loops for the bobby pins to keep it secured in your hair too. While some tiaras stand like a crown on your head giving you a regal, elegant appearance, other tiaras can be positioned in any way you’d like. 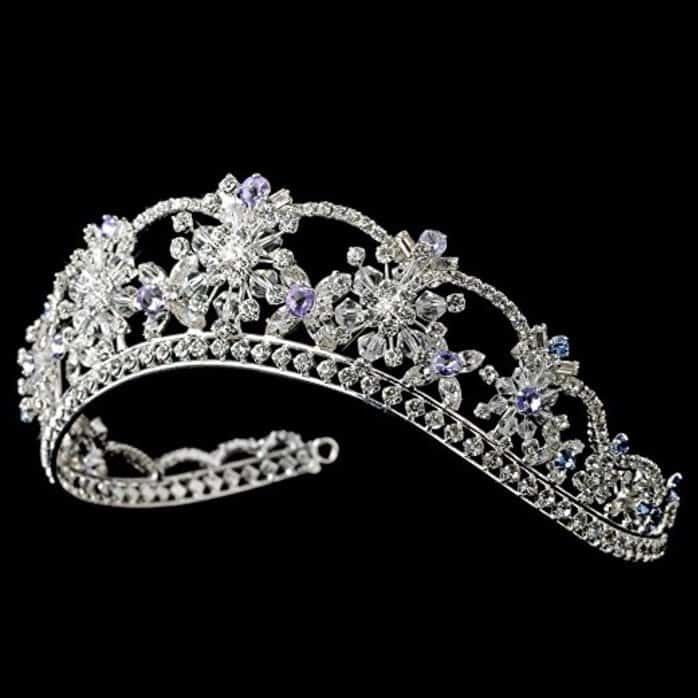 With this tiara, you’ll feel like an ethereal goddess who has stepped out of the forest to marry the man of your dreams. 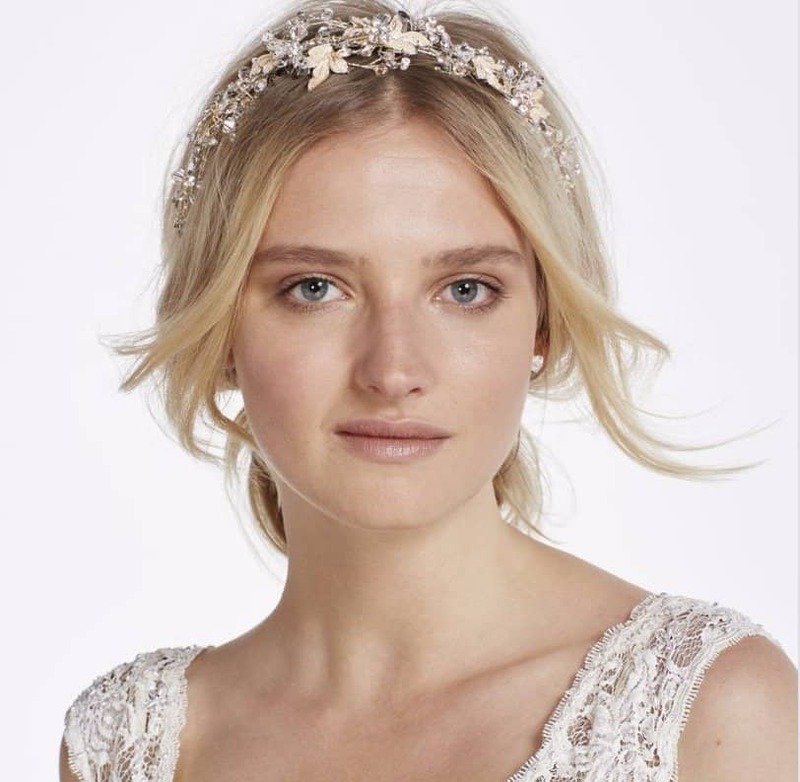 This tiara is champagne with clear crystals and delicate leaves. There are loops on the end for securing with pins. 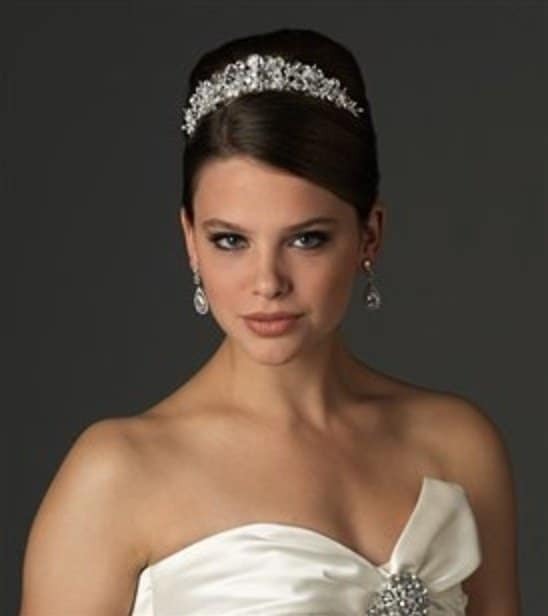 This silver plated wedding tiara headpiece makes an incredible accessory for a lovely bridal gown. It sparkles and shines with dozens of crystals in shapes like pear, marquise and round. It’ll go beautifully with a white or off-white gown especially one with crystals or beading to match. The tiara is 8 inches long and 1.25 inches tall at its highest point. 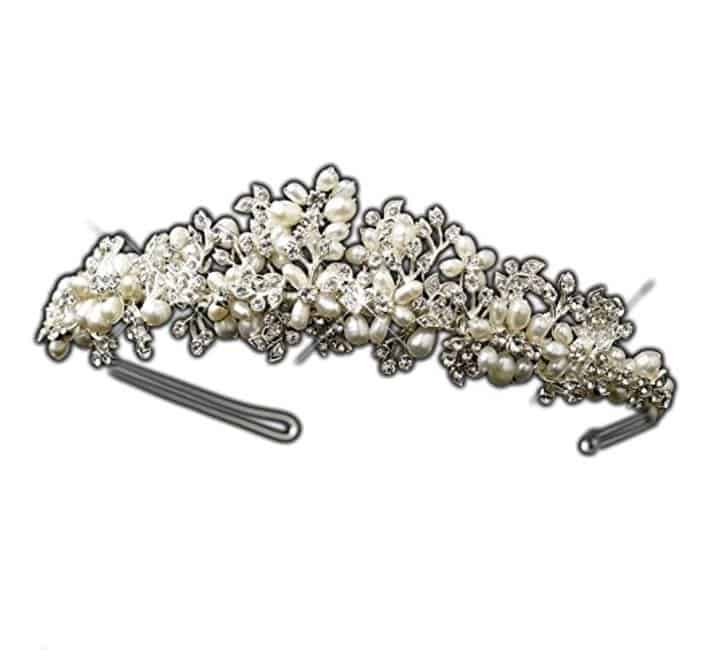 There are loops at the end, which are essential for ensuring that the headpiece stays secure throughout your big day. While some of the other tiaras and crowns on this list are clusters of beautiful stones and pearls, this is a stunning collection of delightful sparkle in the shape of flowers, vines and leaves. The pearls look like petals surrounding cut round crystals. This is wired by hand with metal casting that is rhodium plated for strength and stunning sparkle. The band itself is 14 inches around with loops for pinning. The ornament is 8 inches by 1.25 inches. We were tempted to save this one for last, but we couldn’t keep ourselves away from this stunning hair adornment. If you’ve ever wanted to look like elegant royalty on your wedding day, this crown was inspired by Princess Diana. Anyone who loved the Princess of Wales or was enamored with royalty shouldn’t pass up this replica of Diana’s crown. It’s covered in Swarovki crystals and white pearls. While the princess might have had diamonds in her crown, yours will still be a knockout. The crown is 8 inches long by 2.1 inches at its highest. 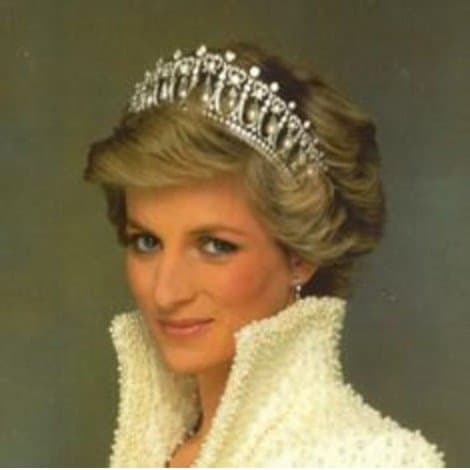 You fairytale wedding will be complete with a replica crown worn by Princess Diana. You’ll look like a princess yourself. For your “something blue”, you can choose this stunning wedding crown for your special day. Not all brides wear white on their wedding day, and you can add a bit of color to your bridal ensemble with touches of lilac and light blue in your hair adornment. There are clear Swarovski crystals and rhinestones as well as tinted crystals in this 14 inch wide by 1 – 3/4 inch tall band. There are loops at the end for fastening, too. Each arch of the crown is held up with a cluster of stones in the shapes of flowers. There’s intricate detailing on the curved edges of the tiara as well. This crown will make you feel incredibly regal and elegant on your big day. On your wedding day, you’re allowed to play the part of the princess, and there’s no better way to do that than with an elegant crown or tiara. You can choose one that’s a knockout eyecatcher, or one that’s subtle and pleasing. Don’t be afraid to be the center of attention on what will be one of the most important day of your entire life as well as the start of your future with the man you love.